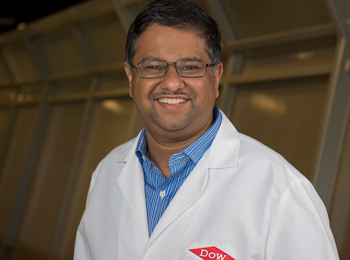 Abhishek Roy, Ph.D. Roy is the lead product research and development manager and technical platform leader for the reverse osmosis (RO) membrane chemistry platform of Dow Energy and Water Solutions. Roy is credited as the primary inventor of DOW FILMTEC™ ECO Reverse Osmosis Elements. The solution fights water scarcity by delivering 40 percent better purification with 30 percent less energy and has the potential to impact millions of lives. FILMTEC™ ECO Elements require less energy to pump water through the membrane and less chemicals for cleaning. These combined benefits result in significant operational savings for customers, ranging from 16 to 19 percent. Besides water-energy nexus, Roy and his team have contributed toward addressing two of the most critical emerging needs: increasing availability of fresh drinking water in developing countries and taking steps toward making water reuse economical and practical. Introduction of the breakthrough residential tankless product has reduced the footprint cost and DOW FILMTEC™ XFRLE product is enabling low-energy operation under challenging water in water reuse applications. These technologies have enabled more than 10 new products over the last five years. Roy was honored with the prestigious Dow Sustainability Innovator Award in 2014. The DOW FILMTEC™ ECO Reverse Osmosis element is a ‘Breakthrough to World Challenges’ under Dow’s 2015 Sustainability Goals, recognition that the innovation played a significant role in the Company attaining these goals and that the product is both an ecological and commercial success. The DOW FILMTEC™ ECO Reverse Osmosis element is also a 2014 Edison Award winner in the Energy and Sustainability category. The Moore Medal will be awarded on September 13, 2016, during a luncheon at the Chemical Heritage Foundation (CHF) headquarters in Philadelphia as part of Innovation Day 2016. This event will be jointly hosted by SCI and CHF, bringing together more than 150 leading researchers from industrial laboratories to discuss current trends and issues in chemical research. Roy earned his PhD from Virginia Tech under the guidance of James E. McGrath in the macromolecular science and engineering program. He has authored 30 peer reviewed journal articles and holds 10 issued patents, with many pending on his RO work. Roy was recognized with numerous awards including Dow’s prestigious Sustainability Innovator Award and Virginia Tech’s outstanding recent alumnus award from the College of Science.